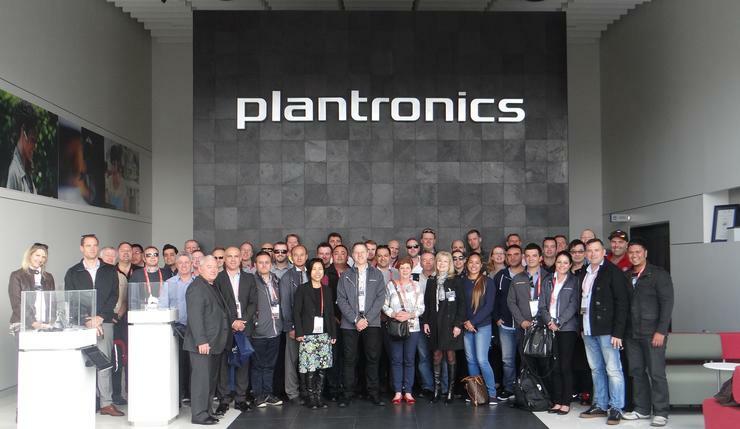 Australia’s top UC resellers and distributors took the long haul flight to California to attend the Plantronics partner event from February 19 to 23. As well as keynotes from Microsoft and Cisco, attendees were treated to a smarter working tour at the Plantronics Santa Cruz head office. Participants also visited Plamex facilities in Mexico and took a silicon valley tour of Google, Apple and other tech giants’ campuses. Partners also had a first-hand preview of some new Plantronics products. Australian resellers in attendance included ATD Technologies, OfficeLife, Telephone Wreckers, Clear Voice Communications, Copia Business Machines, Interquartz, Telelink Business Systems, Tri Comms, Staples, OfficeMax, BTC Direct, Comms-Plus Distribution, Headsetera, Headsetsonline Pty Ltd, Myithub, Simply Headsets, AAAHeadsets, Ensyst, Headset Solutions, Johesk, Kloud, MIS Communications, NSC, NSC Group/Telstra NAS, RTV Computers, Telephone & Communication Services and Trucom. The distributor presence included the likes of Auroz Pure Distribution, Dicker Data, Anixter Australia, Amber Technology, Anyware Computer Accessories, Roadhound Electronics - Mobile and Bluetooth, as well as Brightstar Logitics.